How big? Well besides the gi-normous list of rumored updateswe posted about back in May we're now hearing from a number of sourcesthat the Live dashboard is going to be getting a second interfaceoption, one that will use the yet-to-be announced motion controller to navigate. This new user interface, we've been told, will recreate theincreasingly cluttered dashboard "blade" system in a 3D environmentthat will be something more akin to the Minority Report than a filingcabinet. The motion controls will allow users to sort of slide throughthe different levels of this floating menu system. Sounds like a fantastic idea, if it can be implemented correctly. Japanese teachers might feel a little uneasy about their jobsecurity, as one of the country�s schools has begun triallingNintendo�s DS console as a way of teaching kids to read and writeEnglish. According to a reportby Reuters, Japan's education ministry allows schools to decide onwhich teaching tools to use, whether it�s pencils and textbooks, orinteractive games consoles. 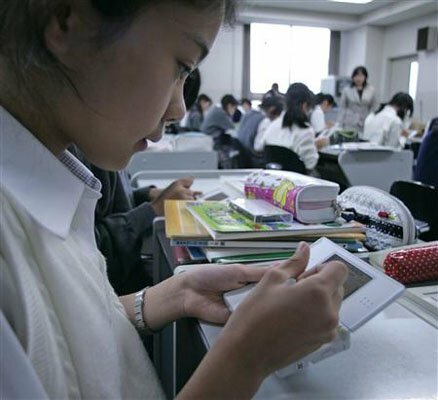 The Tokyo Joshi Gakuen all-girls school opted for the DS and hasbeen using the console in classrooms since May, as part of a one-yeartrial. Students use the console primarily for English vocabulary,penmanship and audio comprehension. Junko Tatsumi, Vice Principal at the school, said that students are�really concentrating and have fun in gaining skills such as spelling". The school clearly still has reservations about potential �abuse� ofthe console�s features outside of English lessons. The vice principaladded that once English lessons have ended, �students cannot play DSgames outside - all consoles and software are collected" beforehome-time. US students are more interested in listening to music during classthough, it seems. Since February, around one in every 100 students atthe Fort Summer High School, New Mexico have been encouraged to watcheducational videos and listen to lectures on Zune players donated byMicrosoft. Almost all content is either created or recommended by the school�steachers, with students encouraged to plug-in during class hours and onjourneys to and from home. The trial aims to discover if such devicescould eventually be incorporated into everyday education. During a keynote Q&A at the Paris Game DevelopersConference, Blizzard SVP Rob Pardo revealed that World of Warcraft wasoriginally planned as a free-to-play title. According to a Gamasutra report,Pardo told GDC executive director Jamil Moledina: "When were firstgoing to make World of Warcraft, we wanted to make it free andadvertising supported." "We didn't want to charge a subscription, but as we researched market conditions, we realised that wouldn't support us." Pardoalso referred to the upcoming Activision and Vivendi Games merger -forming a new entity to be known as Activision Blizzard. "It really doesn't affect us at all," he said. "Onething that was great about this particular merger is that Bobby Kotickand all the great people at Activision didn't want to do this dealunless everyone at Blizzard bought into it." "They really wantedto get to know us, and that's never happened before... they wanted tomerge with us because ultimately it would make us a stronger company." NYPD Commissioner Ray Kelly has been a harsh critic of violent games like Grand Theft Auto in the past. But a report in Newsdaysuggests that Kelly's own officers may soon be using video game tech totrain on firearm tactics. The training will include simulatedshoot/don't shoot confrontations with game-like avatars who moverealistically and have authentic facial expressions. Therecommendation for specialized video game training comes from the RandCorporation. The think tank was hired in the wake of theNYPD's controversial shooting of an African-American man, Sean Bell, on his wedding day in 2006. [TheNYPD's] current simulators are very good, but it's pretty oldtechnology... [Video] gaming has gotten a bad reputation becausethey're all about shoot-'em-ups. But maybe a better way of looking atit is to look at something like the NBA basketball [video games]. Thequality of the figures is very real and the quality of the facialexpressions is very real. If you can give a student a lot of scenarios,it changes the nature of the learning experience. A new Experian Consumer Research survey comparing Xbox 360 and PS3owners has thrown up some wonderfully frank and comedic results. Apparently, Xbox 360 users are far more likely to say that they are unable to live without books than their PS3 counterparts. Butthe PS3 contingent hit back hard on the newspaper front, with way morerespondents (well, 103 compared to 60) saying that they would be deadif they didn't have newspapers. The age of console owners is alsointeresting� with more in the 18-24 age bracket loving their Wiis, butwith those at 44-years old being far more likely to own a PS3� almosttwice as likely in fact. Ifyou think that's funny, read on. In a frankly pointless psychometricstatement test, the PS3 and Xbox 360 owners agree that "real men don'tcry", although the Microsoft-ers state that they are "more interestedin nature". But while the Xbox 360 folk are reading their gamingmagazines, PS3 are buzzing around go-kart tracks the nation over orplaying board games. The only question is�why on earth are people asking these questions?